FISHING FOR FISHIES – King Gizzard & The Lizard Wizard featured in their Wiggles-esque music video for the title track of their upcoming album, Fishing for Fishies, due for April 26, via ATO/Flightless Records. 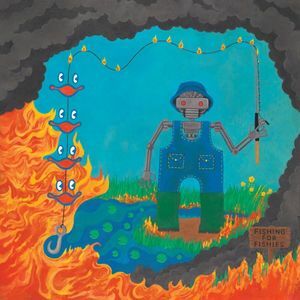 From the several singles that have been released for King Gizzard & The Lizard Wizard’s upcoming 14th studio album, Fishing for Fishies, which is set to be released on April 26, the versatile band went from concerned environmentalists with the quirky melodic sing-along title track to the kings of thrash metal with the recent “Planet B.” Due to this change in style, many fans have expressed interest as to what the upcoming album’s style will incorporate. However, “Planet B” was released as a non-album single, thus this extreme thrash metal style will have to wait—which shouldn’t take long if you’re familiar with how fast King Gizz’s albums are released. But even without this track, the previous singles contrast one another greatly. The monstrous early single “Cyboogie” is sonically driven with elements of psychedelic rock that unsurprisingly features a robotic voice effect, whereas, the wild “Boogieman Sam” incorporates a harmonica driven ’70s-blues rock style, which would be a perfect classic-rock-radio jam for the future. In the third verse of “Cyboogie,” there seems to be this overall theme of environmentalism concerning aquatic animals with lyrics such as “Cyboogie’s fishing for fishies, pickling trout in a binary brook / How is it that he is depressed / The humans have pierced through his cheek with a hook.” This has been expressed on later singles, primarily the friendly, but concerning title track, which includes a rhythm section that is perfect ocean word painting. One song from the upcoming album that seems to have been forgotten is the unrestrained polyrhythmic “Acarine,” which was released as the b-side to “Cyboogie” back in January. “Acarine” seems to embody the numerous styles from the other singles—changing from an appealing harmonica solo to something Alan Parson would’ve released back in the day with its bubbly synths and upfront electronics. According to the album’s tracklisting, “Acarine” will come before “Cyboogie,” which will serve as the closing track. It will be interesting to see if there will be any other grooving-electronic tracks that will come before the latter two. This drastic change-in-style seems to be the embodiment of what King Gizz is all about. After 13 studio albums that have covered a wide-range of musical styles, it seems like the band can do anything at this point—especially after releasing five albums back in 2017. But from what Mackenzie said above, Fishing for Fishies seems to have drove itself. Who knows, maybe they even recorded a hip hop track too. Check out the tracklist for Fishing for Fishies below along with the cover art.